In pursuit of a brain that works and a mood that's happy, I've tried a ton of things. My supplement cabinet is now filled with nutritional hacks for PMS relief, focus, mood boost, and hangover avoidance. I prefer trusted brands that have good sourcing and come recommended by friend and functional medicine superstar Dr. Stephanie Daniel. Her suggestion toward Julia Ross's book on amino acid therapy kept me off anti-depressants during a tough time. I am now convinced that one trigger for depression is a depleted brain. When the nutrient suggestions started getting overwhelming, I created a graph to keep them organized. I color coded the supplements so I could see which colors/nutrients played a role in multiple benefits. Notice how green Omega3 is involved in everything. Amino Acids are building blocks that help make our skinny/pretty/happy hormones and brain chemicals. B vitamins pull double duty in the body!! They are the mechanics that help convert these building blocks into hormones and are also the soldiers that buffer against stress. If we're stressed, we often don't have enough Bs left over to make enough feel good chemicals. With that workload, we go through a lot of Bs and many of us require a converted "methylated" form. Vitamin B injections work well for many and I love them. Vitamin D3 is the energy, happiness, thyroid function, appetite suppression, bone strength, and immune system 'super hormone' that most of us are low in. I like Vital Nutrients D for when I travel and an under the tongue spray for home. Omega 3s are the good fat our brain craves. Mood and clear thinking are directly tied to Omega3 fatty acids present in the body. The aging brain needs even more. Minerals are the cofactors that make sure the important reaction in the body take place. Magnesium, the calming mineral that is crucial in the brain is involved with over 300 chemical processes in the body! Probiotics are the good gut bacteria linked to happy mood, manageable waistline, and possibly everything else! Fiber feeds our good bacteria, sugar feeds the bad bacteria, and probiotics refill the ranks giving us more of the good. Helpful if our partying lifestyle, stress, or antibiotics have killed off our good guys. Below are the daily 5 I take. I start my morning with a ton of lemon water to flush my organs and get my adrenal, immune, and skin supporting Vitamin C. I take my brain and mood supporting amino acids on an empty stomach. If I want extra focus, I'll take a Neurothera or a NooTroo nootropic. If it's a tea/coffee day, I like the bullet proof executive style of blending nutrient rich grass fed butter into my tea for delicious brain food. After a couple of hours of fasted work time and flushing of my system, it's time for a protein rich meal with eggs or salmon. Here is where I take the fat soluble supplements like B, D, and Omega 3 that absorb best in the presence of fat. If the work morning has left me anxious, I'll take a calming NeuroCalm filled with Taurine, GABA, Magnesium, and L-Theanine. Because my stress hormone cortisol is unfortunately high, I also take a daily adaptagen formula that builds back my buffers giving me more stress resilience. I wrote the FreeTheFat weight loss program around this product after seeing stress' connection to stubborn weight retention. The desire to feel focused but calm while lowering both my inflammation and cortisol inspired the CALM HAPPY FOCUSED bundled. 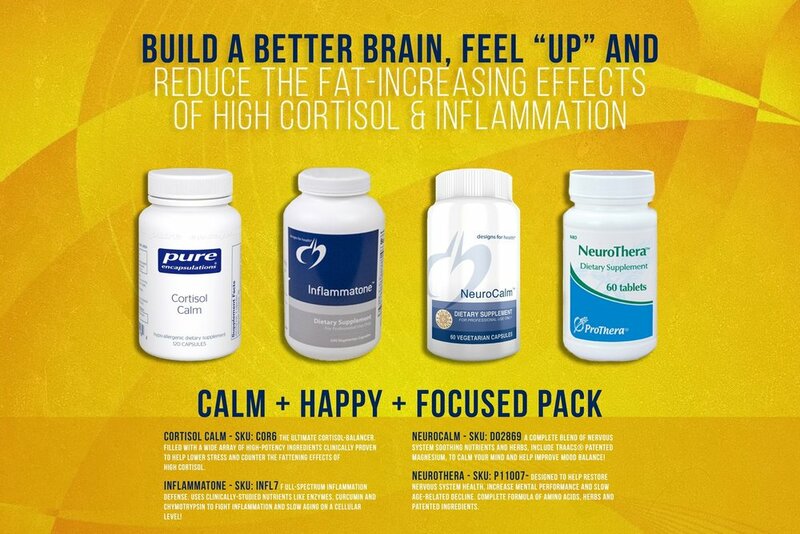 Neurothera is the addition here with it's cognitive amino acids and mood boosting herbs. The rest of the bundles are found on the supplements page and shown below. Notice that the same 5 supplements are put into different combinations for desired mood effect. These are my favorite addon to my daily essential 5. I like the CALM HAPPY FOCUSED 4 pack -which is the same as buying Calm Pack + Happy Pack (but cheaper when bought together). Not until I venture out of mood / stress and into beauty / hangover helper do new supplements emerge from the antioxidant family. If I've been partying alot, I take the 3 antioxidant rich blends found in the BEAUTY BLEND. The hair/skin nails for beauty, antioxidant formula for anti-aging and the liver detox to support my liver. If I'm running low in general, I'll restock with the biggest bundle THE WORKS that comes with wonderful digestive enzymes to get the most out of my food and free radical destroying antioxidants to help with aging and hangovers. This has the highest overall savings but still feels like a huge sticker shock even though I can do the math logically. And finally, my super secret for when I'm truly depleted: IV therapy. Dr. Ahluwalia of Dryp.com has locations all over the bay. At $200-$300 a pop it gets pricey but man does it work to put you back in the game. I love the master antioxidant Glutathione add on!! Come flu season, opt for the extra zinc and selenium. Love to hear your tips and tricks! Here are a few other helpful graphs I put together along this journey to feel good. Always open to new nutrient suggestions, leave yours in the comments below. To toss back the tequila shots with the fun kids or sip soda water and lime and live to conquer the next day with productivity and fervor. Ninja trick: Drink > Supplement / Water > Detox.